My definition of a herb is "Any Plant or part of a plant that can be used as Medicine "
I use my herbs as a diagnostic tool as well as drawing on my many years of Clinical practice to determine what would be best suited to the individual. As medicines I incorporate herbal formulas, flower essences and sound essences as well as sound healing, combined with dietary advice to address imbalance and physical, emotional, spiritual disorders in the body. By working Holistically we can affect a far greater change in our overall well being and health. In our overly polluted world we need not only remedies to heal our bodies but also we need to have ongoing Health Maintenance Programs. It is my belief that this is where herbs play a most important and vital role. Herbs can be taken on a daily basis in our foods, as teas, herbal wines, tinctures etc. for health maintenance. The leaves, flowers,seeds, fruits, roots and rhizomes can also be eaten as foods. I work intuitively selecting herbs that suit the person based on what I pick up energetically from them and through using kineseology. I provide individual Herbal formulas, general formulas and formulas for specific ailments as well as my own range of Herbal/Flower Essences and Sound Essences. Click the Flower essence or Sound Essence links to go the page for details of each essence. If you click the following link , Herbal Tinctures , it will take you to the page that has a list of all the tinctures I have available in my clinic. I have over 300 tinctures in my dispensary 99 % of which are made by myself and my Partner at our Herbal Farm in the Perth Hills. This allows me to come up with an infinite number of combinations for Herbal formulae. 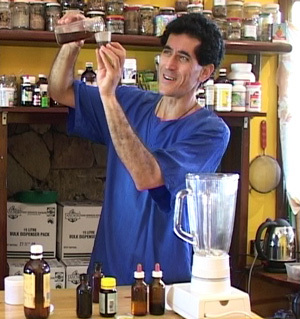 I use Old school methods for making my Herbal Tinctures which includes " Double Extracting " a method by which more of the water soluble actives of the plant are extracted , to produce a more potent Tincture. Apart from the Herbal Tinctures that we manufacture, we also make herbal oils, herbal vinegars, syrups and Smudge sticks. If you are wanting a particular Herbal Mixture, type the name of the Mixture or Disease state in the search bar at the bottom of the side menu of the page . NB- Some herbs are contra- indicated with specific Allopathic medications. If you are taking any prescription drugs, please contact us for safety information before ordering any Herbal Mixtures. Please be Aware that we are a small operation and live in a Rural area. We make an effort to get orders out in a timely manner however due to our schedules, there can sometimes be delays. We thank you for your patience. We post orders twice a week when possible. NB. There is no express post service to Perth metro or suburbs. It is Only available to Interstate, overseas or North west W.A. Disclaimer : At The Herbalist, we do not diagnose disease or illness. We can offer programs to assist in your health journey , after you have had advice from your doctor or specialist. Should you have unexplained symptoms, please speak to your doctor or specialist . We make no healing claims about any of the products offered on this website. Formula - The mixes listed below are to aid the body in your healing Journey. We do not make any healing claims about any of these mixes. Usual Dosage is 5ml twice a day for adults. Children's dosage dependant on age are available upon request. Note: The prices above do not include shipping costs, which will be added during checkout based on your location and the weight of your order. We make every effort to keep our pricing down so that our mixtures are affordable. Unfortunately we have just had a major increase in the cost of the organic ethanol we use and have had to increase some of our prices slightly.